It's a relaxed entry this time, an update on some recent happenings in the Linux audio world. Without further preamble, let's take a look at some of the good things going on there. nspluginwrapper is an Open Source compatibility plugin for Netscape 4 (NPAPI) plugins. That is, it enables you to use plugins on platforms they were not built for. For example, you can use the Adobe Flash plugin on Linux/x86_64, NetBSD and FreeBSD platforms. The wrapper was easy to build and install on my AMD64 system, with only one hiccup. The instructions indicate that my 32-bit plugins should be installed to /usr/lib/mozilla/plugins, but on my system they should be installed to the /usr/lib/mozilla-firefox/plugins directory. 64Studio includes both directories, trial & error paved the way to success. 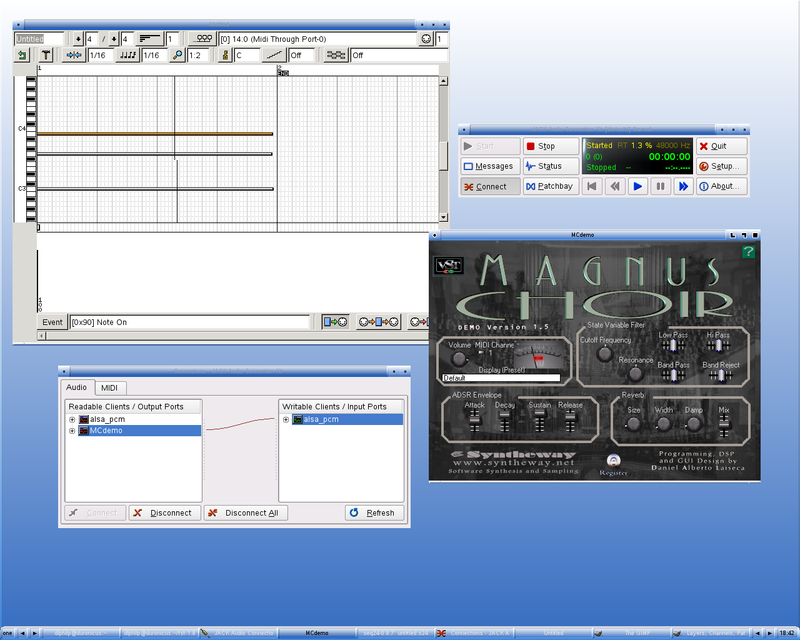 In my last entry I introduced the Jacklab Audio Distribution (JAD). I've been very pleased with the distribution itself and with its lively discussion forums. JAD's users and developers are devoted to the distribution's continuing evolution, and its latest version (alpha 3) has addressed the concerns I voiced in my review of the alpha 2 release. The new version offers the JAD low-latency kernel as its default Linux kernel, the CONFIG_PREEMPT_DEBUG option has been removed, and many other enhancements have been added. The distro maintainers are very responsive to polite suggestions and critique, so give the new release a whirl and be sure to let the developers know what you like and don't like about it. The latest JAD includes wineasio, a driver that adds basic ASIO support to Wine. ASIO is a means of achieving low-latency timing for Windows-based sound and music applications. 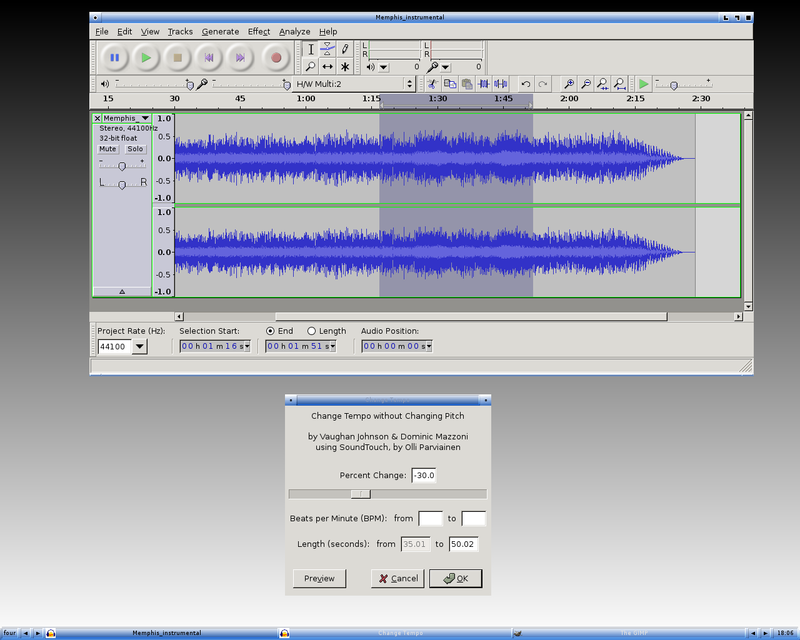 Like Linux, the stock Windows installation provides support only for the demands of consumer-grade audio and generally is unsuitable for professional audio programs. 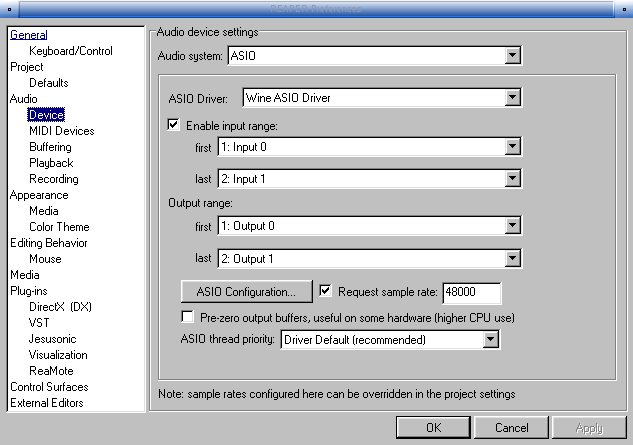 ASIO works around the inherent limitations of the OS to provide professionally acceptable latency; wineasio brings the same performance upgrade to WINE, and the driver may provide a best solution for running Windows audio applications with low latency. The wineasio driver may resolve long-standing issues plaguing users who want to run their favorite Windows audio applications under WINE with stable support for running VST/VSTi hosts and applications such as the excellent Reaper. I tested Reaper on my Duron box with WINE 0.9.22 (Figure 1) and on my AMD64 iron with WINE 0.9.35 (Figure 3). Performance was okay on the lower-end machine as long as I worked with minimal resources (mostly MIDI and only lightweight audio), but it choked on multitrack audio with a few plugins. Alas, the wineasio driver can't be used on the default build of WINE for the 64-bit box, but even with the WINE OSS driver Reaper's default demo played without a hitch on the faster hardware. I'll stress test Reaper with wineasio as soon as I have a faster 32-bit machine. So, it is possible that we may yet see WINE running some of the major Windows music programs in a low-latency Linux environment. Meanwhile, VST vendors might want to note when their products have been run successfully under Linux. I discovered the Syntheway plugins in a Google search for "vst linux", and the demos have convinced me that the software is worth the price of purchase. I look over the lists at KVR-Audio and I think that it's definitely a good plan to evolve a stable support system for existing VST plugins and rewrite and recompile them whenever possible. 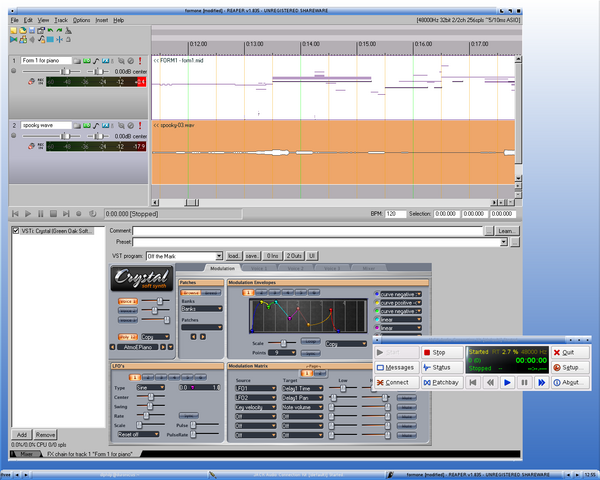 Porting is a fairly straightforward process for rewrites of open-source plugins (yes, there are open-source VST plugins), as demonstrated by Jorgen Aase's energyXT2 audio/MIDI sequencer and Lucio Asnaghi's JOST plugin host. However, it is unlikely that the high-profile plugin houses would open the source code for their products, hence the need for further development of the FST and dssi-vst projects. I'm not really expecting Native Instruments to provide direct support for Linux, but I would like to see Linux provide stable support for NI's products. I've been teaching one of my students how to play Lonnie Mack's "Memphis", a classic blues-rock instrumental from the early 1960s. Lonnie's no slouch on the guitar, and my student Sam is a sharp learner, so we decided to employ Audacity to help him conquer the more difficult passages. We loaded an MP3 of the song into Audacity, selected a tough region, and used the cool Change Tempo tool to slow the original performance tempo by 30%. Shift-clicking the Play button looped the playback, so we could accurately learn (and I could accurately tab) the difficult parts at a comfortable tempo, still at the original pitch. Thanks to this process, my student has gradually increased playback speed and will soon be playing accurately at the original tempo. As an added benefit, he's also shown more interest in what else Audacity can do, and I'm sure I'll hear something remarkable from his endeavors. After all, Audacity is very cool and Sam is a very bright 10-year old. Native Linux audio development proceeds apace. 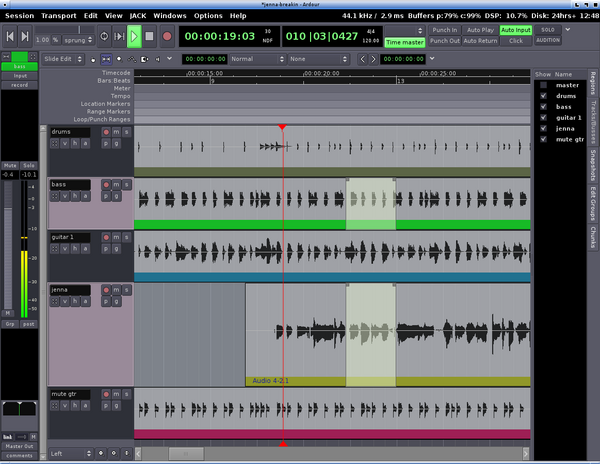 Ardour2 RC2 is chock-full of fixes and features and is now available for public testing. By the way, you can now support Ardour development via the project's subscription support plan. Check the program's Web page for details, it's an easy and effective way to help fund Ardour's development. 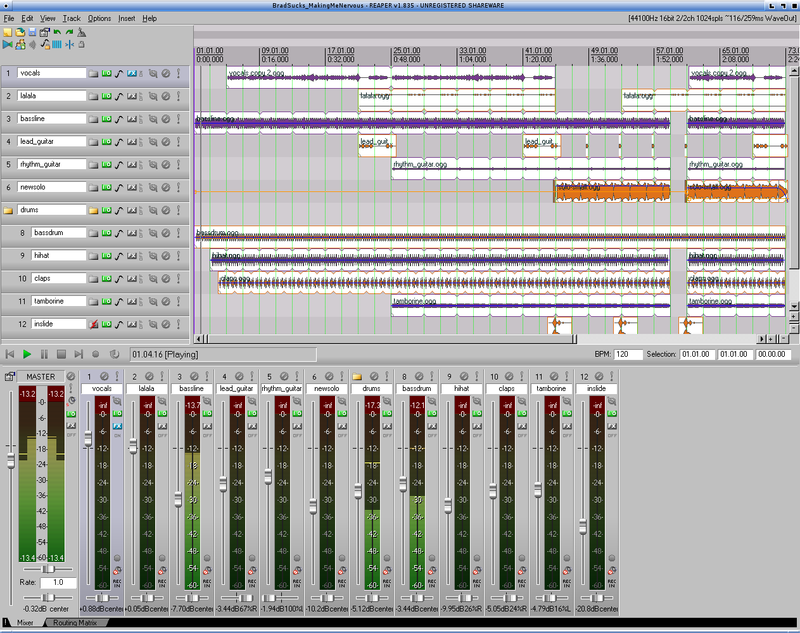 NB: Ardour 2.0 has been officially released for Linux and OSX. See the Ardour Web site for further details, and look forward to a review here soon. Matthias Nagorni's ALSA Modular Synthesizer (AMS) is an excellent software realization of the classic modular synthesizers of the 1970s. Dr. Nagorni has ceased active development of the program, but he bequeathed its source code to future developers. Karsten Wiese and Malte Steiner have revived the project with a recent release that squashes some old bugs and shows off some new features. AMS is a cool synth, and I'm especially happy about its compatibility with my 64-bit system. I've played with it for only a little while, but it sounds great and seems perfectly stable with JACK now. 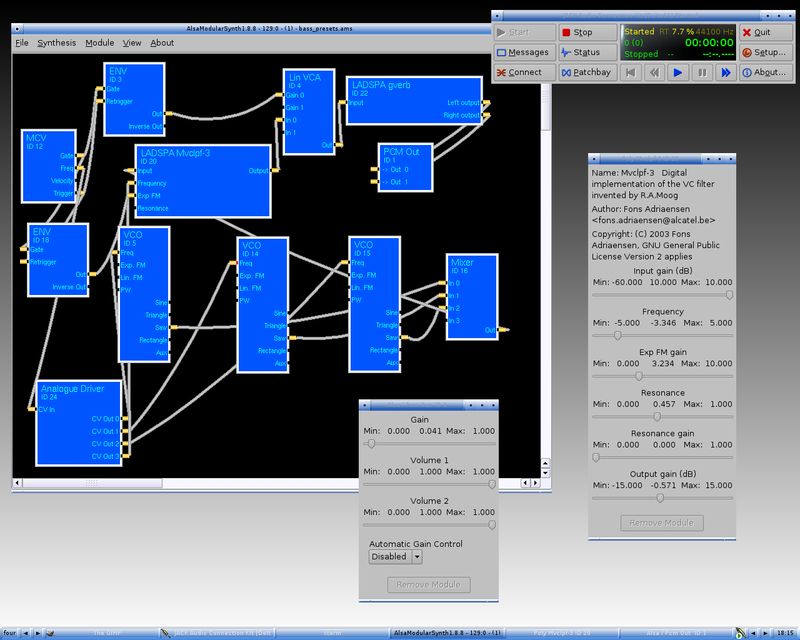 Figure 7: The ALSA Modular Synthesizer rides again. Just when I was going to complain about the lack of native Linux synthesizer development: Sean Bolton recently upgraded his excellent WhySynth and Hexter softsynths, and the revived Specimen project (now helmed by Eric Rzewnicki) has released a significant new version of its cool MIDI-controllable sampler. I'd still like to see more native Linux synth development, but it's just as good to see these worthy projects carry on. By the way, if you'd like to keep up with the latest releases of Linux sound and music software you should consider joining the Linux Audio Announce list. Be aware that this moderated list is for announcements only. If you'd like to learn more about what Linux audio users and developers are up to you might consider signing up for the Linux Audio Users and/or the Linux Audio Developers mail lists. Topics and skill levels are wide-ranging, and everyone is welcome. Many cool things are happening in the Linux audio world, I have a lot of profiles and reviews in the works, so stay tuned and check in again soon. Hasta luego !